It was July 2002, and the song was already out of season, but from a street away one could hear the heavy thud of Busta Rhymes’ Dangerous. It had become the signature song of Awudu Issaka over the years, one that indicated that he was back home for the summer holidays. He played it loud and so often that a few of the toddlers whom he used to gather around had developed their own signature dance routines to go with it. To them, he was the neighbourhood hero, and his arrival in town meant jerseys, boots and football kits in general for all, not forgetting the little parties that also became a staple. This “man of the people” attribute coupled with his football wizardry meant that a portion of the suburb of Lashibi Community 20 where he lives has been named after him. Back then, his presence attracted the rest of his professional buddies including the likes of Kwame Quansah, Anthony Obodai and the late Aboubakari Yakubu to our neighbourhood pitch, it was inspiration beyond measure. Little did he know that the career that had brought him goodwill was about to turn his life on its head. 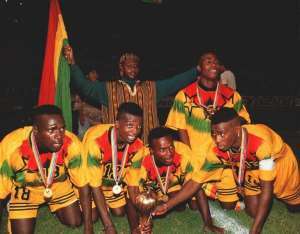 Despite establishing himself as one of the continent’s most exciting prospects on the back of helping Ghana win the 1995 FIFA U – 17 World Cup in Ecuador, securing regular playing time was an issue that consistently plagued him. 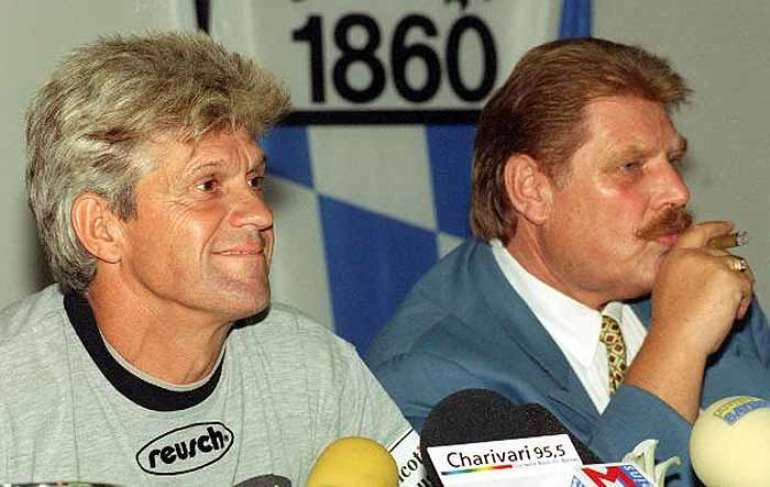 “My biggest obstacle at 1860 Munich was Thomas Hassler; there were times where I even prayed that he would pick up an injury so I could replace him. 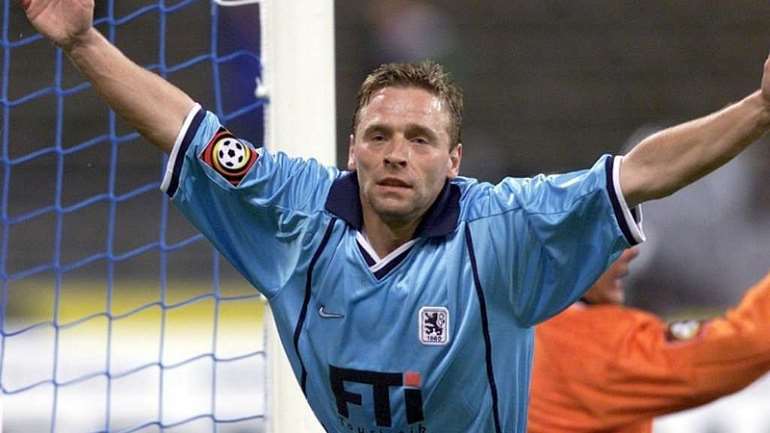 In the midst of his battle to dethrone Hassler, the disaster of 1860 Munich struck in the 2003/2004 season. After a decade in the German top flight, 1860 Munich lost their spark and finished 17th essentially sealing their relegation to Bundesliga 2. That, however, was the least of the misfortunes as Club President Karl – Heinz Wildmoser, his son and two others were arrested for accepting bribes in connection with the construction of the Allianz Arena. The plethora of bad decisions the club had taken would set in motion a series of events that led to Issaka terminating his deal to return to Ghana. The club insisted on moving him to their second team and converting his professional contract into an amateur one, a deal he rejected outright. “I was not a happy man because they were trying to take away my livelihood. I still believe that the bitterness that I felt when I departed the club is one of the reasons why they have not been the same since “he revealed while shaking his head. Without the luxury of his weekly cheque from 1860 Munich, for the first time since 1999, his street was eerily quiet when he returned home that summer. He still showed love in the smallest ways possible but over the next 12 months, it was evident that his financial situation was dire and the man that once lit up people’s faces with his jokes could barely keep his own shoulders from slumping. He even endured jail time in Malaysia for close to two years at a point when he was seeking to put his faltering career back together. He had unknowingly violated the terms of his travel documents. He left Ghana with his agent in the hope of signing for a Malaysian club he had been negotiating with for weeks but upon arrival, the team offered him terms which were completely different from what had been agreed upon. In his own words, the new deal was insulting and in the process of completing procedure to return to Ghana was arrested at the airport. Again, his good networking skills would be brought to the fore as he would emerge as the leader of a large group of detainees. It was while in detention that Jesus appeared to him in a vision, eventually resulting in his conversion from Islam to Christianity. Here he used to gather other detainees around to preach the word of God up until when he worked out his release. However, through all the gloom, he would discover that two of the decisions he had made earlier in life would become the pillars around which his journey to salvation would be established. i. 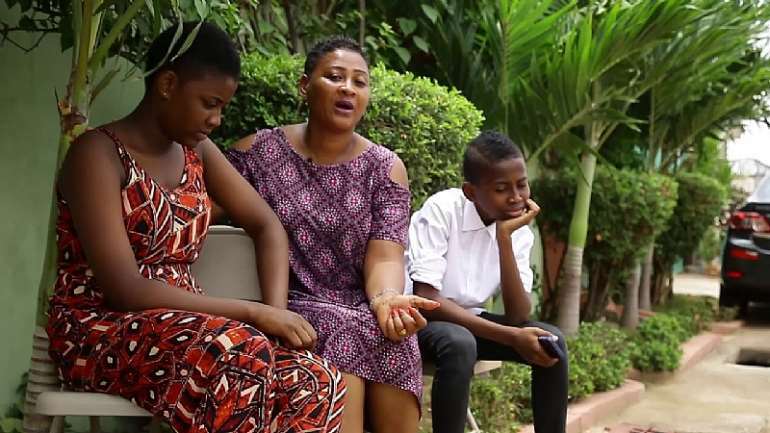 The decision to marry Amina Issaka, a woman who stood by his side through all his troubles. She sold ‘waakye’ (A local rice meal), to support me and the family and the business went really well. This phase taught me many valuable lessons and built my character. It taught me that life is all about what you want to achieve. She is a good wife. ii. The decision to purchase an estate house when he made his first serious bit of money. As a young man who left the Brong Ahafo Region to seek greener pastures in the city of Accra, adversity was not new to him. 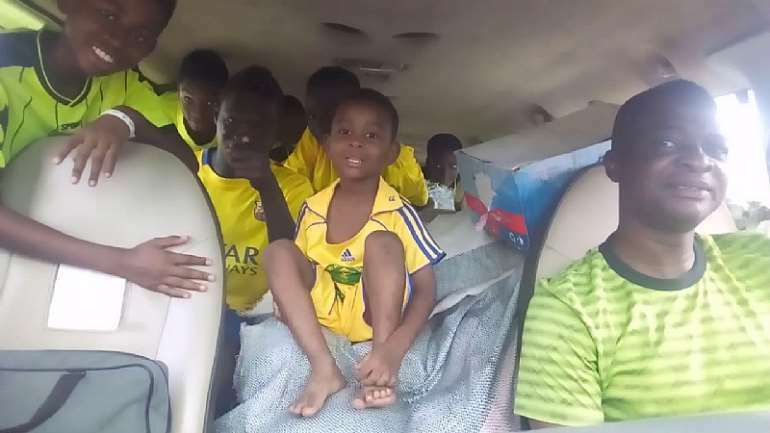 After conquering the football pitches in the Zongo’s of Sampah, a suburb of Sunyani, a fourteen-year-old Awudu Isaaka, motivated to challenge the exploits of his then role model Joe Fameye, took the decision to move to Accra. With no family and friends to rely on, the backstreets of Adabraka would temporarily become his home as he sought a way to showcase his talent to the world. His woes deepened as circumstances forced him to relocate into a makeshift structure behind the Nungua Divisional Police Headquarters. Here he was compelled to wake up at the crack of dawn to catch a bath at the beach after which the day was spent looking for any form of footballing activity that would push him closer to the dream. Soon the daily hustle yielded enough funds to cater for transportation and a little food for a week’s adventure. 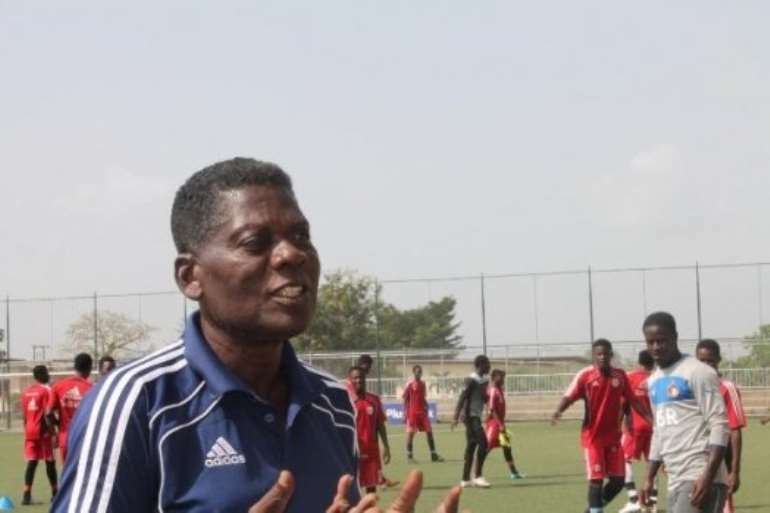 It culminated in him catching the eye of the handlers of Ghana’s U -17 team. “I took to washing coach Arday’s car and doing his laundry, “he revealed. Aside his sublime touch and penchant for the flashy and flamboyant on the football field, Issaka was quite an entertainer and took it upon himself to entertain his teammates in the national team. “I would pose as a vendor of traditional medicine in the bus and have everyone laughing. My infectious personality and playmaking skills made me an indispensable part of the team “he explained. His journey had been arduous but it provided the backbone for which he would set out to introduce children to the game he so loved. The Sun had barely set that Saturday when I knocked twice on the gate that was partially open. A young man stuck his head out to see who it was before letting me in, he could not have been more than 16 years. He let me in and quickly disappeared behind a door to what looked like an outhouse that had recently been added to the original building. A colourful mix of flip flops and slides lay haphazardly in front of a door that was partially open and a vast array of voices talking in low tones could be heard from beyond. My eyes darted in all directions at once because in that small front yard there was so much to look at. Training bibs and jerseys hung on a makeshift drying line with dumbbells and a bench press a few meters away. It was then that it dawned on me that the once cosy, colourful home of the Issaka’s had given way to a house academy. In addition, I realized that he and his nuclear family had moved out of the main house, handing it to the academy products while moving into a newly constructed quarters behind the main house. I stood there thinking to myself. But my thoughts were interrupted by two voices chatting animatedly in French. There stood Awudu Issaka, speaking fluent French with a lad he referred to simply as mon ami. As I would soon find out, he made a personal mission to learn French when he joined Ligue 1 side, Auxerre. He emphasizes that the club makes it compulsory for the players. “My educational foundation was weak, but I am a very determined person and I put my mind to achieving this task. I persevered until I could speak and write the language,” he said. Before even attending to me, he roused the rest of the sleeping bunch to wake up and quickly filled out chores and assignments for the day. This was a man in charge of his business and regardless of how small and amateurish it was in its operations, he had made little additions that gave hope for the future. 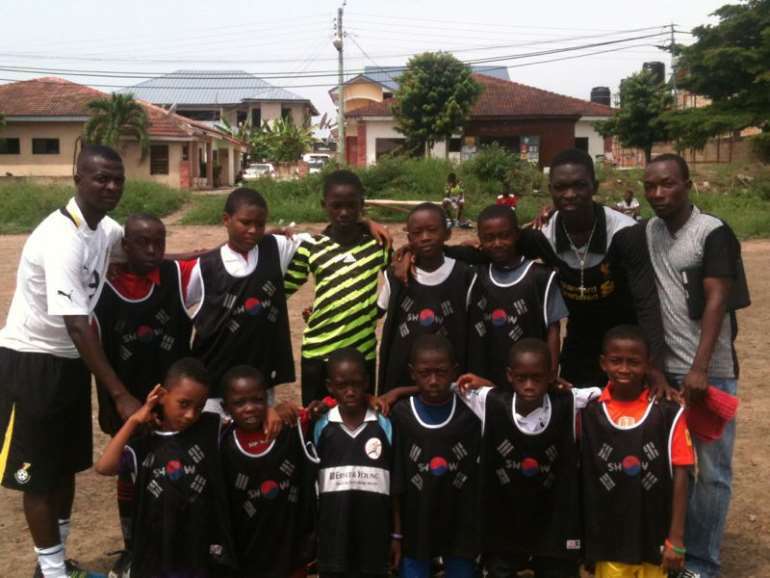 Since its inception in 2011, the Royal Awudu Issaka Soccer Academy (RAISA), which enrols kids between the ages of 10 – 20, now boasts of about 80 boys from different countries across the continent including Burkina Faso, Togo and Cote D’Ivoire. He plans on engaging a tutor to help the boys better their fundamentals in a number of subject areas, while also talking up the possibility of introducing them to Information technology. For those that have no educational background on which they can build, he has started the process of helping them learn other vocation due to his belief that an athlete’s career can be snatched from them at any given time. Currently, the Community 20 Park in Lashibi, which is stony, hard and undulating, is where RAISA hold their training sessions and play their home matches. An upgrade to the facility with bleachers to accommodate patrons that come to watch matches will go a long way to boost the morale of all that are affected. On days when they have to travel to take on an opponent, he serves as the team driver, welfare manager and hype guy among many other roles. I must honestly admit that this mode of operation is crude and not acceptable, but a man who has shown competence to raise this dream from the ground up since 2011 deserves help and commendation. As far as raising the structures that would nurture potential world class players are concerned, he has a long way to go. On my way out of his home, I noticed that a mini Ford bus painted in RAISA colours stood in the same spot that used to be occupied by his plush Toyota Celica sports car. Awudu Issaka is a man on the right path, I told myself.